John Baptist de La Salle is credited as one of the founders of modern classroom-style education. As a priest living in 17th-century France, De La Salle was led by the spirit of God to become involved in the education of youth. Education became his vocation. During his lifetime, he founded a religious order of men, the Brothers of the Christian Schools, who devoted themselves to teaching boys and young men. To assist the Brothers in this ministry, he developed the first real strategy for teaching, created a teacher’s manual, wrote student textbooks, and opened a school to train teachers. He challenged the Brothers of his community to look upon everything with the eyes of faith, to see the person of Christ in their students, and to approach their ministry with great zeal for the evangelization of youth. By the time of his death in 1719, he had established numerous schools throughout France that followed his ideals. This success was later copied in Europe and in America. John Baptist de La Salle was an educational innovator. He looked at the world and saw a need to educate all children, and responded to that calling. In De La Salle’s day, education was reserved for the privileged; generally only those boys and young men whose families could afford private tutors studied at all. Relatively few of these men went on to university. All subjects were taught in Latin, greatly limiting the spread of education and texts. There were no programs to train teachers. The tutors of the day were well-educated men who performed this gentleman’s occupation to earn a living. De La Salle realized that this approach closed education to all but the very wealthy, perpetuating an entrenched upper class while cutting off opportunities for bright but poor children. He believed that the working class and poor had a right to quality education, so he directed his efforts to these youth. What was truly revolutionary was De La Salle’s understanding that a tutorial approach to instruction would never be able to reach the masses-a new technique for instruction was needed. Thus, he developed the simultaneous approach to instruction, using monitors to educate small groups within a larger group. These groups were the first “classrooms,” and this form of instruction remains the principal form of instruction worldwide some 300 years later. St. John also understood the critical need for teacher training to ensure success in the classroom, as well as the benefit of teachers continuing their training throughout their careers. Before placing teachers in the classroom, De La Salle trained them and called the teachers aside periodically to renew their instruction. He wrote a training manual for his teachers, The Conduct of Christian Schools, that included extraordinary insight to the task of the classroom instructor. The book outlined rules and techniques for class teaching, including regulations for maintaining discipline, steps for teaching reading, and even for student assessment and discipline. John Baptist de La Salle had great love for the poor. He demonstrated this devotion by taking the poor teachers into his home to feed them, by giving away his patrimony, and by requiring the brothers to teach the poor and working class. He held school on Sundays for those working-class youth who had to labor during the week. De La Salle even opened a school for “incorrigible delinquents.” Probably at least some of these youths we today would classify as special-needs students. 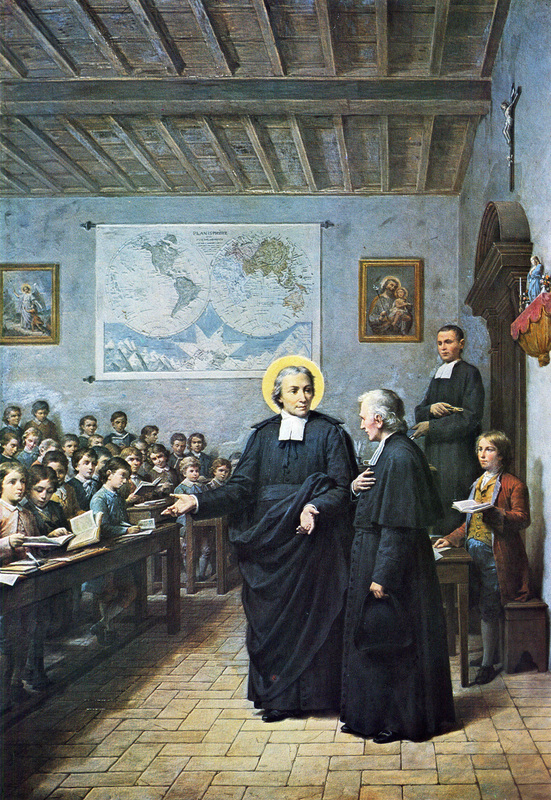 De La Salle and his Brothers succeeded in creating a network of quality schools throughout France that featured instruction in the vernacular, students grouped according to ability and achievement, integration of religious instruction with secular subjects, well-prepared teachers with a sense of vocation and mission, and the involvement of parents. In 1900, John Baptist de La Salle was declared a Saint. In 1950, because of his life and inspirational writings, he was made Patron Saint of all those who work in the field of education. At the present time, there are De La Salle schools in 80 different countries around the globe. As we look at the life of St. John Baptist de La Salle, a man who lived hundreds of years ago and in a very different world, we see that the principles that guided his life are still those that guide us today. These same principles can be the driving force for all of us involved in the glorious ministry of Catholic education. De La Salle must be in awe when he sees the work that he began continuing today all over the globe by faithful Catholic educators.